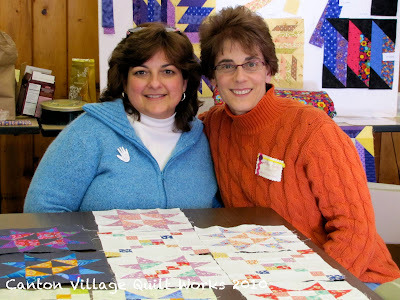 This past weekend I was invited to a wonderful quilting retreat in Rhode Island. My friend Tina of Seaside Stitches invited me and I was just so excited!! I was able to meet her for the first time. She is such a wonderful friendly, and talented lady who has the most charming family! I also met a ton of new and terrific talented quilting ladies. They were all so much fun and very welcoming. Thank you all for having me at your retreat! Too much fun! Here we are together, Tina on the left, me on the right! You can see that we worked on our Star Crazy BOM. Here you can see my 30s and Kaffe blocks. Behind them you can see Tina's beautiful batik blocks. Tina is all caught up through March. I am totally caught up through February. But remember I am doing 2 versions simultaneously. 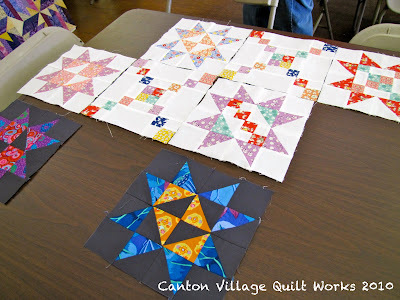 I hope to have the March blocks done before the end of March. Cross your fingers!! Here is another shot of my blocks! The only two blocks that are missing from the photos are the Irish Chain block in the Kaffe and Kona Charcoal. But rest assured, I did complete them. I just forgot to take a photo. Please go visit Tina's blog, I know you will love it. She is a very creative soul and a great teacher too. She taught us at the retreat!! 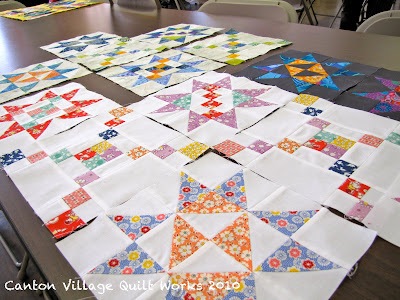 The next post will show you the quilt that she taught. Also of note, please go to see Victoria at Bumble Beans. 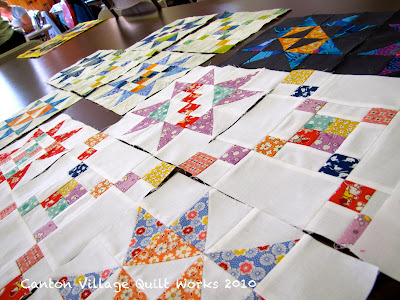 She is requesting house blocks be made for charity quilts and she needs your help. To join in just click here. Once you are done at Victoria's, go here to get your Kona Color Card. They are going fast!